Gosh, I feel like it has been forever since I did a fashion piece. Being constantly busy with work and school has left me little time to be creative, but things are settling down and I am getting into a groove. Summer is going to be warm this year in Vancouver - YAAS PLEASE! I am really excited for the glorious summer days full of sunshine and warmth because it means I get to rock some really cute chambray rompers! Like last year, the chic overall trend is back for another year. I got a pair of chambray short overalls in a light fade for the summer days. It has a drawstring waist tie and adjustable straps. The light weight chambray material makes this cute and flirty romper from Aritzia the perfect piece for the warm days ahead. I like to wear a cute striped top or even a cropped top on hot days under the romper. I would not wear only a bandeau under the romper just because it is not my style. I feel a t-shirt underneath is much cuter. Also, I would choose a top or crop top that is not sleeveless. A short sleeve really lets the straps of the romper stand out more and not blend in with the sleeveless top underneath. I generally like to pair my rompers with white birkenstocks; however, on cooler days I will throw on a pair of sneakers. If the day gets chillier, will pair my romper with a long cardigan or for a bolder statement, a denim jacket! When Denim-on-Denim is done right, it is tres chic! Do try on the rompers in store when shopping because I find some styles can be quite short. I was actually a little surprised by how short some were when I tried them on! Also, rompers tend to ride up through out the day. Also try sitting down in the it to make sure you are comfortable in it and it does not ride up too high for you! 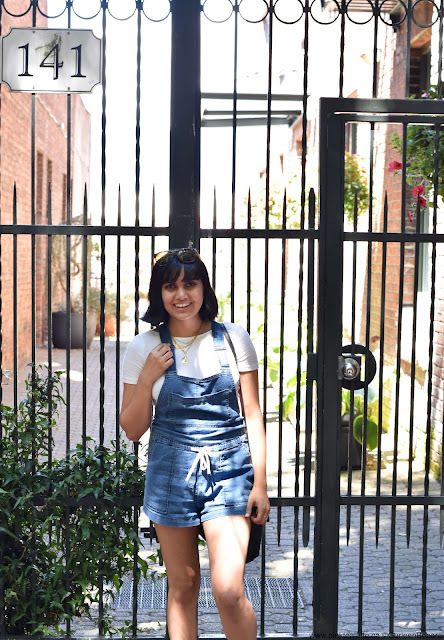 If you are still deciding on if you should get yourself some short overalls for the summer days, I definitely urge your to grab a pair already! Not only are they amazingly comfy, I have yet to come across an individual who has not looked adorable in one.